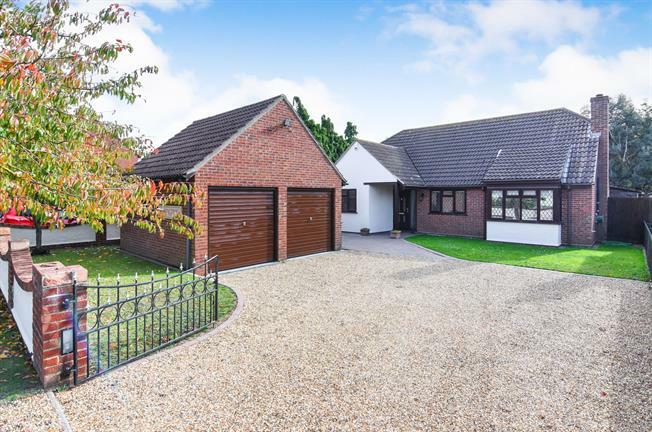 3 Bedroom Detached Bungalow For Sale in Chelmsford for Guide Price £500,000. Being offered with no onward chain is this well presented, three bedroom detached bungalow. Internally the accommodation comprises of three double bedrooms with en suite and fitted wardrobes to the master, a large lounge/diner in excess of 26', family bathroom, a modern fitted kitchen and a conservatory. The rear garden is sheltered, and un overlooked featuring an impressive pergola seating area, and a heated swimming pool. The front of the property features a large driveway with parking for multiple vehicles and hard standing area for a boat/caravan, as well as access to the detached double garage which has been refitted as a work shop. The property is being offered with no onward chain so a viewing is highly recommended.